“Fun” may be the best way to describe a Rossini opera overture. 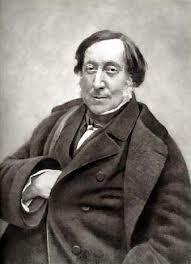 Gioachino Rossini (1792-1868) was a master of long, expectation-building crescendos, sparkling, virtuosic woodwind solos and musical jokes, which included sudden, loud, out of place chords. These operas would have been considered popular entertainment-drama mixed with sports, in the form of the vocal acrobatics of the singers. Recently, I ran across this exciting 1990 Metropolitan Opera performance of Rossini’s Semiramide Overture. As you listen, pay attention to the great sense of style in the playing and consider what elements make this music so much fun. Can you hear musical conversations taking place? Do the melodies and the sounds of the instruments suggest characters, distinct personas or dramatic situations? Read the history and synopsis of the two act opera, based on a Voltaire tragedy, here. Tim, as always, a great post! 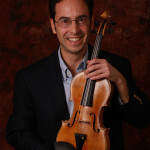 I have vivid memories of performing that with Muti in the NYP, and he described the violin runs as strands of spaghetti, e.g. lighter in texture. Also remember this overture being used as a Kansas City IMAX pre-show trailer highlighting the best of KC, including their orchestra. Brilliant stuff! Thank you for sharing your memories of Muti, Thomas. It’s amazing how the wisdom imparted by a great conductor tends to stay with you. There are some great horn parts in there, too! A very interesting recording of a little-performed work. Thanks for posting it. On a slightly different topic, do you have any thoughts on Rossini’s “tragic” operas as opposed to his comedies? I really struggle with the latter – I grudgingly admire the skill shown in the ensembles but am terminally bored by endless triplets (= “funny music”) in most of the arias – but would be happy to hear more performance of the former. One possible explanation why e.g. Tancredi, Otello, Mosè in Egitto, La donna del lago and Semiramide are so rarely performed is that they are too similar to early Verdi: is this fair? And do opera companies have a responsibility, if not a duty, to present a more complete picture, ensuring that Rossini is not thought of as the pasta cook who in his youth wrote L’italiani in Algeri, Il barbiere di Sivilglia, La cenerentola and the theme tune for the Lone Ranger? Enough of my rant. There is a serious point in there somewhere, though! Thank you for bringing these questions up, Graham. The comparison of Rossini’s comic versus tragic operas is interesting as well as the similarities to early Verdi. I’d be interested in hearing the thoughts of other opera fans regarding these topics.